You can buck with tradition and dress the shredded cabbage with a bit of lime juice and toasted cumin seeds, include chunks of avocado, or go crazy and treat the stew more like a chili and add cheese or sour cream to the mix too. Yes, the whole thing requires a bit of time, but most of that time is just the pot on the stove or in the oven, with no work required by the chef. For extra flavor, ask the butcher for a pork shank or knuckle bone to add to the pot, too. Cut the pork into chunks. Most classic posole recipes will have fairly big pieces, but if you prefer to cut it into bite-sized pieces, that works also. Decide what size you prefer and go with it. For extra flavor, include a few pieces of pork shank or knuckle bones in the mix. Add the cooked or canned and drained hominy and oregano. Continue cooking at a simmer until the flavors blend and the pork is very tender, another hour. Add additional water to keep ingredients covered as necessary, returning the mixture to a boil and reducing back down to a simmer when needed. Taste the broth and add more salt as necessary. 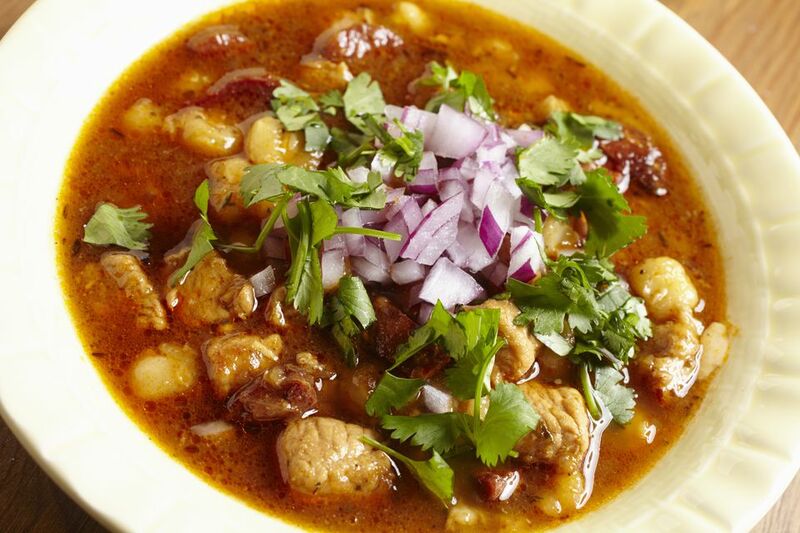 Serve the posole in deep bowls and let everyone top their portion with garnishes as they like. * Canned hominy works fine here. If you want to start with dried, put 1 cup dried hominy in a large pot and cover with cold water. Bring to a boil and add enough salt to season (the water should taste a tad salty), reduce heat to maintain a steady simmer, and cook until just tender (about 2 hours), drain, and then use as directed in the recipe above.